Here are 5 things to consider when deciding on your wedding date. Some may be obvious but sometimes the excitement of wedding planning can cloud our common judgement! Check that calendar, check with your family and friends and last and most important- please yourself! 1. Choosing a date and finding you haven't left enough time to properly organise everything and have missed out on good vendors/suppliers. 2. Deciding on a date too far away and losing momentum and excitement throughout your planning. 3. Choosing a date on or around a big holiday and risking guests not being able to come due to their own family traditions or holidays and also having to pay premium for accommodation on a holiday weekend. 4. 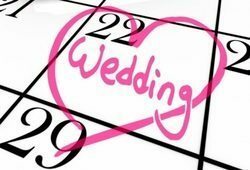 Forgetting to check events guides to see if there are any large events that could affect your wedding day such as a festival that will cause roadblocks or a big game on that will cause resentment in guests. 5. Not consulting employers and finding out your company is planning a large launch the day before that you need to be involved with. This also goes for important family members or friends that are an integral part of the day.